I've been on a lot of flights in the last year & a half. If I had to guess? I'd say 15-20 round trips to various places - London, Israel, Florida, Vegas, Ohio, LA, the list goes on. Many are for work & some are for play; with so few friends nearby, I've made travel a priority so that I can see the people I love, wherever they may reside. I've been lucky with, well, all of those flights. Sure, I've seen a delay here & there, a middle seat when I was desperate for a window, etc., etc. The little aches & pains of travel, you know? 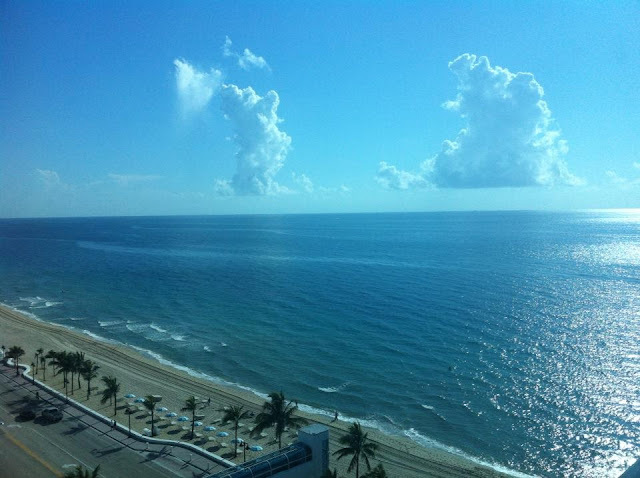 But never in my life have I experienced the kind of travel debacle that I encountered yesterday, when I flew from Newark to Fort Lauderdale to attend a conference for work. If you follow me on Twitter, you may have watched it all go down. You may even have have unfollowed me for clogging up your feed. I tweeted way too much, I know (sorry) - but what else is there to do when your plane is stuck on the Tarmac, grounded for FOUR HOURS? In Yiddish, we call yesterday a "balagan," a mess of the highest order, & truly, I cannot imagine a better word for this experience. First, we were grounded for weather - a tornado warning in Jersey, bad storms in North Carolina. Normal stuff. And then? We'd taxied for so long that we had to go back to the gate to refuel. And recalibrate. And replace a flight attendant because one of ours was escorted off the plane, presumably for going batshit crazy on two passengers. In both cases, I was just out of earshot of the passengers on the other end of her ire, but in neither case did they seem to exhibit behavior that warranted the her yelling - & yelling it was. It was the loud, barely controlled, about-to-go-off-the-deep-end kind of yelling. The "YOU DO NOT SPEAK TO ME IN THAT TONE OF VOICE OR I WILL HAVE YOU EJECTED FROM THIS FLIGHT" ego-trip kind of yelling. Clearly her threats were empty, as she was the one ejected from the flight - & clearly I missed something major, because when she got off the plane, two cops were waiting for her. 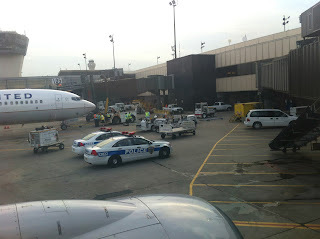 The captain had told us that when we pulled back up to the gate, we'd be able to get off the plane while they figured out what to do with us - but because two cops were waiting when we arrived, no one was allowed to deplane. "Security risk" & all. Of course, airplanes are pretty big machines, & they heat up pretty easily. Really easily, actually. And when people get overheated, they drink a lot of water, which the crew kindly passed around in plenty. But when it came time for us to try to take off again, the captain came over the loudspeaker to announce that we couldn't leave until we'd replenished our water & ice supplies - which we'd of course used up in the four hours we'd spent stuck on our plane. My fellow passengerslet out cries of mutiny , promising to subsist on soda & spirits, & we pulled back from the gate sans H2O. I know, I know, I was a little snappy, which, as a community manager myself, is something I try not to do to brands. But come on! I'm basically tweeting a scene from a movie here, folks! They assured me (I use that term lightly) that they'd get us up in the air as soon as they could. Promising, I know. And did they comp us anything? No, of course not. My "dinner" (a box of snacks) cost $8 & the free in-flight DirecTV they promised us didn't work. Of course, as with any disaster, there were a few small good things, if you were keeping an eye out for them. A couple of our flight attendants were really great, for starters, & our captain was a saint, continuously updating us & apologizing & trying to keep us happy. About an hour & a half into the wait, my phone at 47% battery, I discovered a power outlet next to my seat that allowed me to keep live-tweeting the affair & checking my work email. And of course, at some point this will make for a really funny story, right? Not today, but at some point. Because WHOA. Balagan, right? We landed in Fort Lauderdale around 10pm, four hours after we were supposed to touch down, & after nearly seven hours on that sweaty, cramped, godforsaken airplane, I can't tell you what a welcome sight that airport was. I also can't tell you how committed I am to never flying United again - after my flight home on Sunday, of course. Wish me luck? !